Which of these should go first? Fairly obvious answer? It will be if you’ve ever tried reversing a car with anything at all hitched to the back of it! The caravan is a bit like one our family owned when I was a kid (at least, it had a red stripe) and I well remember the slightly stressy summer-holiday moments of trying to reverse it into little plots on French campsites. The Landrover goes in front. A very very long time ago I did a Discipleship Training School with YWAM (A kind of year-out programme) and this picture dates back to one of those lectures. I’m not even sure who was speaking, so I can’t give them the credit… But the image has remained in a corner of my imagination, and God has been reminding me of it a lot in the past few weeks. 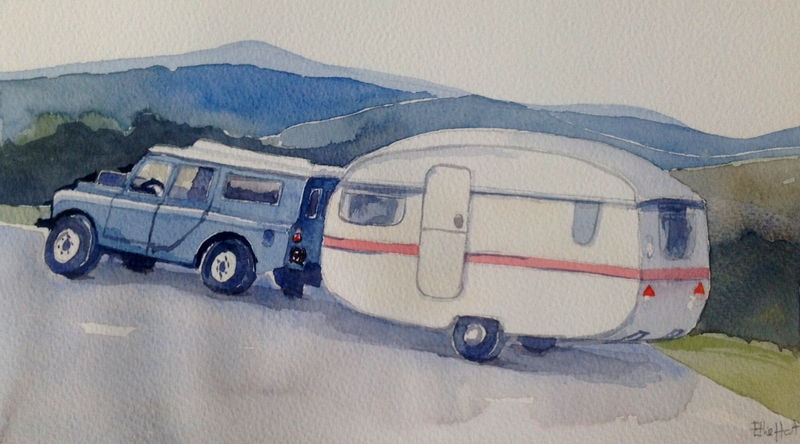 The Landrover is my will and the Caravan is my emotions. In my case, the caravan is fairly large in proportion to the towing vehicle. (It may actually be more of a smart car/6 berth van kind of a relationship). In different people comparative sizes will vary enormously, and both are important… but it’s still clear which one of them needs to be out in front and in charge of the steering! Another way to think about it is a determination to do what I know to be right, even if I really really don’t want to, and hoping that my emotions will eventually line up. Right now I’m calling these Landrover Choices. I once nearly missed out on a wonderful friendship because I was jealous of the young woman’s gifting and opportunities. On that occasion I managed to put my will in front and override the envy and choose to get to know her. I am so glad that I did. Today I’m asking you this: What is the Landrover Choice that you have to make this week. In what decision do you need to choose to make your feelings run behind and let your will be in front? Previous PostGappinessNext PostRunning on empty? Thank you for this post which is very meaningful to me today. I also loved it because my dear Dad always had a Landrover! Oh what a fab word for today, thanks for sharing! I think I left the brakes on my caravan. And a crook lock! My emotions are really protesting against the direction of where I know God wants me to go. Great picture, so helpful to actually visualise what is going on. Thank you for sharing this today. Much food for thought and prayer!